Saturday, May 1, 7:30 p.m.
Mar and Judith will close this month’s show with a performance and discussion of Judith’s poems used in Goman’s piece Maternity Dress along with some of her own related work. Goman and Arcana will discuss collaboration across art forms—describing how Maternity Dress and other works have evolved and developed between them. Copies of What if Your Mother, Judith’s poetry collection will be available for sale. Arcana is a Portland resident and often performs her work at colleges, libraries, bookstores and community organizations. She is also the author of two prose books about motherhood, Our Mothers’ Daughters and Every Mother’s Son and two short poetry collections: Family Business, 4th Period English, and Grace Paley’s Life Stories, A Literary Biography. Also in the gallery on Sunday, May 2, 2010, be sure to check out Passages Bookshop Trunk Sale 10:00 a.m.-6:00 p.m. David Abel will offer artist’s books, fine printing, broadsides, books about books, art and photography for sale. There will be many items that have been long out of print and hard to find. For information on both these events, please click here. <?xml:namespace prefix = o />We hope to see you! We are pleased to introduce our newest gallery artist, Mary Beth Boone. Boone specializes in unique books and assemblages and has been making books for twelve years. Since 2005, Boone has been pondering her family history, sorting through old photographs and other odds and ends from her childhood home. Growing up in a family of creatives, whose mastery included needlework, sewing, and furniture making and refinishing, Boone developed a love of old objects which speak of the past. Common Threads and Portions of a Matriarch are about my mother’s family. 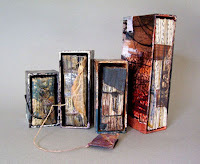 The small accordion books contain reflections, descriptions of relatives, and poems. The third assemblage Wrightsville Beach, Summer of ‘42 is based on a photograph taken by Boone’s father. In her ongoing series, Family Matters, Boone explores her personal thoughts about the meaning and dynamics of family. Boone received a BFA in design from University of North Carolina and an MFA in sculpture from the University of South Carolina. She has received numerous grants and shows her artwork extensively. Boone is a resident of Greensboro, North Carolina. 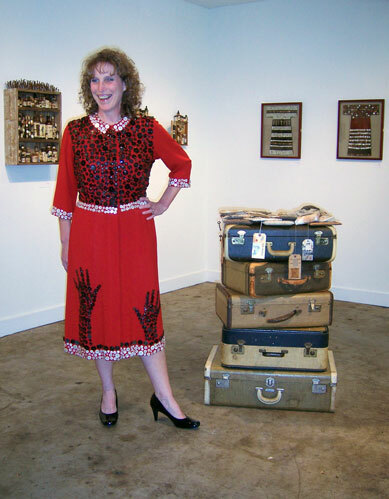 Mary Beth Boone exhibited in our Secrets and Lies show in 2008. To see Boone’s work click here. Please join us for a poetry reading and discussion with Mar Goman (currently exhibiting in the gallery) and Judith Arcana. To learn more about Arcana, visit http://www.juditharcana.com/. 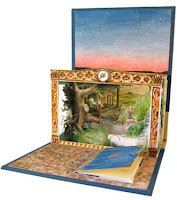 THEME – Pop-up books captivate and excite the child in all of us. They come to life as three-dimensional works of art hidden inside the pages of a book. Pop-Up Now! is looking for handmade artist books that pop-up, move, slide, twirl, whirl, light up, or even sound off. This national, juried exhibition of handmade movable artist books will be held at 23 Sandy Gallery in conjunction with the biennial conference of the Movable Book Society to be held in Portland, September 23-25, 2010. MEDIA – This exhibit is open to hand bound book arts related artworks created as either edition or one-of-a-kind. 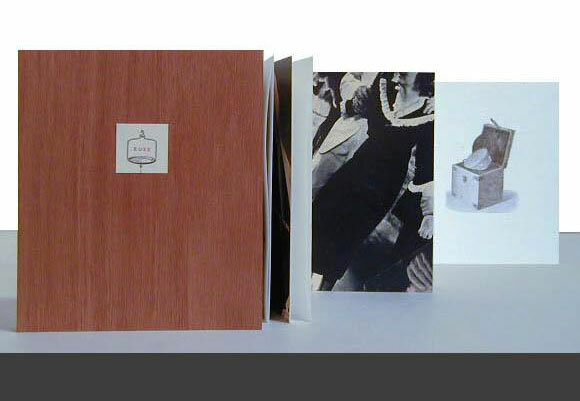 Artist books, sculptural books, book objects are all encouraged as long as the book has at least one interactive, movable or pop-up element. Your books can employ any medium, any style, or any size. DEADLINE – Entries must be received by July 20, 2010. More information and a complete call for entries can be found here. We hope you’ve been able to visit the gallery this month to take in Linda Welch’s Concealed Within series. In this series, Welch has created unique and truely one-of-a kind books, in which the individual pieces are wrapped and encased. Welch’s books respond to the constant bombardment of fractured images and past emotions that seem to interrupt present thought on a daily basis. Primarily focused on visual texture, color and composition, threads of storyline appear in unexpected ways. Welch employs wax, paint, bookbinding techniques, and collage. With this in mind, the viewer can’t help but handle and experience these intriguing treasures. Several books from this series have been acquired by the San Francisco Museum of Modern Art. But don’t let them have dibs on everything! All Concealed Within books are available to take home right away and add to your collection. See Welch’s online catalog here. David Abel, of Passages Bookshop, presents a very special event in the gallery: a trunk sale featuring artist’s books, fine printing, broadsides, books about books, art, and photography. Many of the items are long out of print and hard to find; a smattering; a smorgasbord. You’ll find books by and about such artists as Ken Campbell, Walter Hamady and his renowned Perishable Press, Rampant Lions, Whittington Press, Harry Duncan, Nexus Press, Granary Books, Katherine Kuehn of Salient Seedling Press (pictured above), Landlocked Press, Black Mesa Press, and many others. Please join us! Please call 503-538-8821, evenings, or leave a message to let us know you’ll be coming. Linda Welch is currently showing a broad range of her work in the gallery this month. Of particular interest is her Shakespeare Series, a collection of 17 artist books created from the plays of William Shakespeare. In true Welch style, each book is visual and very tactile as they offer yet another interpretation of these timeless classics. Each miniature volume is created from an altered book of Shakespeare’s plays and is offered individually or in a wall mounted box containing three titles, so you can mix and match your favorites. Welch creates art using a range of media incorporating bits of text and abstract imagery, collage, paint, wax and even a few found objects. In her show this month you will enjoy artist books, paintings and even sculptures made from cast concrete. A relative newcomer to Portland, Oregon, Welch hails from Ames, Iowa. She received her B.F.A. in Ceramics from Long Beach State and M.F.A. in Textile Design from UC Davis, both in California. This is her second solo show here at 23 Sandy. For an online preview of Welch’s exhibit, click here. We are very excited to introduce a new book artist to the gallery roster, Alicia McKim of Denver, Colorado. McKim has worked as a studio and book artist for over twenty-five years. She explores visual language and memory collecting, consciously blending art and mass culture, creating work that we can all relate to in many ways. McKim is a traditionalist in process, yet often unorthodox and experimental at the same time. 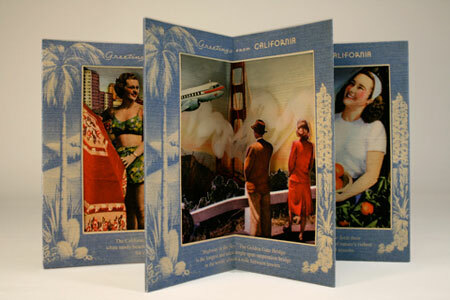 Alicia’s latest artist book, Greetings from California exemplifies this beautifully. The structure of the book is a carousel book, an amazing structure for visual story telling. Using images from vintage California postcards, the reader is transported to the “Golden State.” You will definitely let out a sigh, long for palm trees and sun, and yearn for days gone by when life seemed a little simpler. Alicia holds a Master of Fine Arts in Printmaking from the University of Colorado. Her work is exhibited and sold internationally and is found in such collections as the Getty Research Institute, L.A., the Printing and Graphic Arts Collection, Harvard University, and the Walker Art Center, Minneapolis. Alicia is an instructor at the Rocky Mountain College of Art and Design in Denver, Colorado where she teaches typography and book arts. Learn more about Alicia and this book here. First Friday Rolls Around Again! Please join us for an artists reception for Mar Goman and Linda Welch tonight from 5:00 to 8:00 p.m. Stop by for a glass of wine, a bit of nosh and some great art! It’s also your last chance to see a stunning button covered vintage red dress as modeled by your favorite gallery owner. The dress was created by Mar Goman and is just a small part of her fantastic show. Preview Mar and Linda’s shows here.